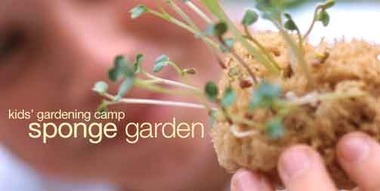 home » garden how to » Kid's Gardening Camp » Grow a sponge! Who says you need a great big yard to garden? You can experience the thrill of seeds sprouting with just a tiny sponge. All you need is a sponge, water, and seeds, and you&#x27;re ready to grow! 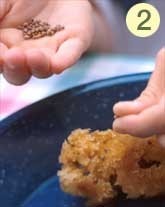 Easy-to-sprout seeds (we used radish seeds, but you could use alfalfa, lettuce, or mustard seeds too!). 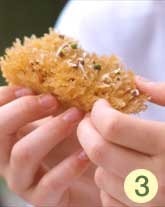 Soak the sponge in water, and then sprinkle the tiny seeds inside the holes in the sponge. 2. 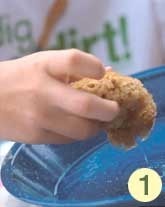 Keep the sponge moist and in about four days, you'll notice little seedlings poking up through the sponge. 3. Clip the little sprouts and put them on a sandwich or salad if you want! Cool idea. I bet this would work better for raising sprouts. I am the only one in my family that eats them and this would allow me to grow them without making too much. Again.. cool idea!